The micro logic 1000 PLC Trainer can control a wide variety of devices to support your automation needs. The Programmable Logic Controller monitors inputs and changes output as controlled by user program which can include Boolean Logic, Counting, Timer, Complex math operations. The compact design, flexible configuration and powerful instruction set combine to make the Programmable Logic Controller a perfect solution for controlling a wide variety of applications. The MicroLogix 1000 family provides small, economical programmable controllers. 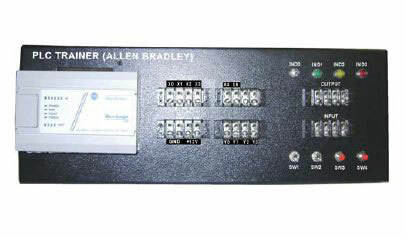 They are available in configurations of 10 digital I/O (6 inputs and 4 outputs). The I/O options and electrical configurations make them ideal for many applications. In front panel, user can connect no. of inputs and outputs & also user can observe 4 switches (2 ON/OFF, 2 Push buttons) and 4 indicators with +12V & GND. And by using above configuration user can write variety of programs. Compact design : Lets the MicroLogix 1000 controller thrive in limited panel space. Choice of communication networks : An RS-232-C communication port is configurable for: DF1 protocol for direct connection to a programming device or operator interface; DH-485 networking through a 1761-NET-AIC converter; DeviceNet networking through a 1761-NET-DNI interface; EtherNet/IP networking through a 1761-NET-ENI interface; or for halfduplex slave protocol in SCADA applications. Comprehensive instruction set : Over 65 instructions including simple bit, timer, and counter instructions, as well as instructions for powerful applications like sequencers, highspeed counter, and shift registers. Fast : Execution time for a typical 500-instruction program is only 1.56 ms. Choice of languages : Software and documentation are available in 5 languages. The hand-held programmer has 6 languages built in. Sequential motor starter interface : This is used to show the sequential starting of motor i.e. one after another. Star /delta starter interface : This interface is used to show the conversion of motors star connection to delta so as to achieve the secure operation & high speed. Car parking interface : This interface is used to show the parking system of cars. Water level controller : This interface is used to show the controlling of water level in tank and also explain the concept of level sensor. Piston cylinder interface : This interface is used to show motion of piston in cylinder to understand how engine works. Reaction vessel interface : This interface is used to show to functioning of dairy industry. Resistance welding interface : This interface is useful to understand the concept of welding process.